Dhanbad has a cosmopolitan culture. So, the cuisine, festivals, music and dance too is an amalgamation of cultures of different regions. However, although people residing here have welcomed different cultures and traditions with open arms and respect others for it, the original essence of culture of Jharkhand remains intact. In fact, everyone rejoices in each other's festivities, dishes are shared and enjoyed together and be it tribal dance or Punjabi bhangra, the audience welcomes both with equal elan! The basic idea is to enjoy together. The tribal music of Jharkhand has social and ritualistic significance. 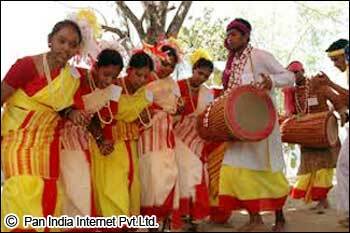 Domkach, Janani Jhumar, Dohari, Adhratiya, Udasi, Pratkali, Daidhara, Mardana Jhumar, Faguwa, Pawa, Vinsariya and Akhariya Domkach are music forms in Jharkhand. Dances form an important part of all festivals and prayers. Natua, Jadur, nachni, Agni, Ghatwari, Jamda are some dance forms prevalent in the state. These are basically seen in villages where major tribal population resides. All these tribal songs and dances are group performances with lyrics pertaining to freedom struggle and love for nature with simple dance steps. Traditional drums used are nagara, tamak, mandar, dholki along with other musical instruments like saranga, horns and clarinets, shahnai, flute, jhanjh, dafli etc. In Dhanbad, people from different states have come and settled here to work in mining organisations. They have come from Punjab, Kerala, Rajasthan, Tamil Nadu etc. and so all cultural programmes have a bouquet of diverse forms of dances. People participate or just watch bhangra, gidda, sammi and mirza of Punjab with the same enthusiasm as they watch Kathakali and Oppana of Kerala or Ghumar and Jhumar of Rajasthan. The black diamond has built the economy of Dhanbad and also consolidated the relationship between residents working in various mining organisations.